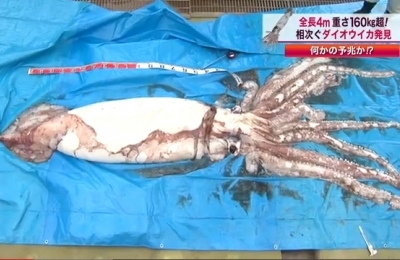 A giant squid was found in the fishing net of fisherman Shigenori Goto just off the coast of Sadogashima island. Unfortunately, the squid died after it was brought to the surface. The male squid had reached a size of 4 meters and weighed around 160kg. Giant squids are rarely seen because of the depths at which they live. The giant squid was taken to the local government marine research institute in Niigata to be studied.